In large bowl, stir together cornmeal, flour, baking powder and salt with whisk. In small bowl, beat egg and buttermilk with whisk. Pour oil into 8-inch ovenproof skillet. Place skillet in oven; heat 4 minutes. Meanwhile, add buttermilk mixture to flour mixture; stir just until moistened. Fold in corn, crumbled cheese, bell pepper and chile. Remove skillet from oven. Carefully pour batter into hot skillet. 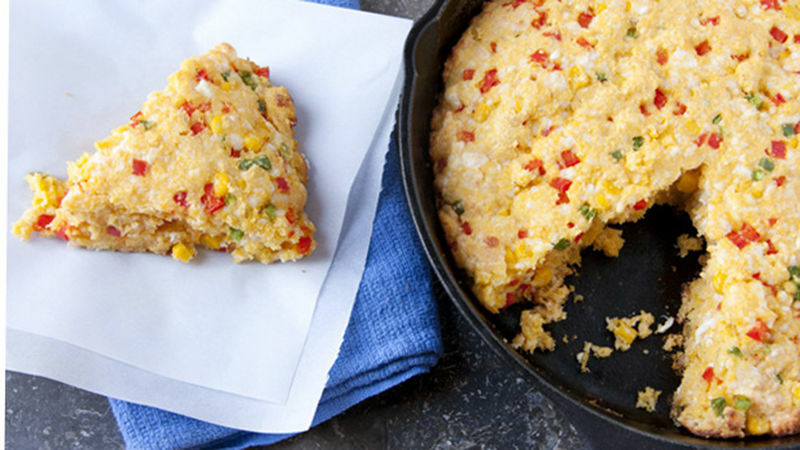 To serve, cut cornbread into wedges; split each wedge in half. Fill with Slow-Cooked Pulled Pork with Chipotle, Honey and Lime. If you don't have buttermilk on hand, use 1 tablespoon vinegar or lemon juice plus enough milk to measure 1 cup. Wear disposable gloves when cutting hot chiles; the oil can burn skin. Avoid touching your face.